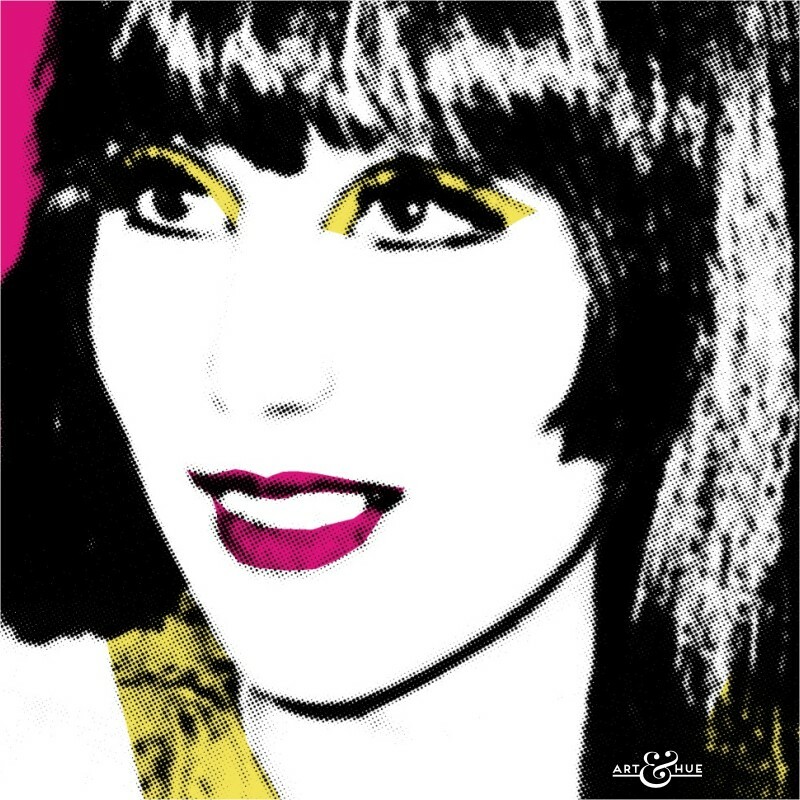 Cher pop art print, part of the “Songbirds” pop art collection. From “I’ve Got You Babe” to “Mamma Mia”, Cher has had a long, varied and successful career in entertainment. Starting as a back-up singer for Phil Spector (her vocals are on The Ronettes’ classic “Be My Baby”), Cher went on to release hit after hit with Sonny Bono including “I Got You Babe” and “The Beat Goes On”, as well as solo hits such as “Bang Bang (My Baby Shot Me Down)”, “Gypsys, Tramps & Thieves”, and “Dark Lady”. Cher also recorded the Burt Bacharach classic “Alfie” for the American release of the Michael Caine film, originally performed by Millicent Martin for the British release, but it was Cilla Black who achieved British chart success with the song. In later years, Cher had continued success with the rock anthem “If I Could Turn Back Time”, where she straddled a warship wearing a black ribbon, and “Do You Believe”, the dance track which turned auto-tune into an instrument. As well as music, Cher demonstrated her sense of humour in “The Sonny & Cher Comedy Hour” and launched a respected and lauded acting career. Her first film appearance in Robert Altman’s “Come Back to the Five and Dime, Jimmy Dean, Jimmy Dean” led to praise and further acting roles, including “Silkwood” with Meryl Streep, for which she received an Academy Award nomination, and her Oscar-winning performance in “Moonstruck”. Known for her ever-changing styles and fashions, from 60s Californian folk to 80s glamour, Cher will forever be associated with the designer Bob Mackie, thanks to their long-standing collaboration which saw Cher wear his glitzy creations on TV and to awards ceremonies. Dedicated to the memory of Cher superfans Simon Midgley & Richard Dyson.